FILE - Turkana people carry water near Lodwar, in Turkana County, Kenya, Feb. 7, 2018. In this arid part of northern Kenya, water can be hard to find, particularly in the dry season. "We used to have difficulties in accessing water and during a drought we could either go to the river to fetch water or ask our neighbors to give us water," said Jecinta Lerle, a pupil and vice president of students at the center's school. "The girls can now have more time to study since there is enough fresh water to go round and there is no need to walk long distances to search for water," said Lotan Salapei, the foundation's head of partnerships. A girl at the Samburu Girls Foundation center in Loosuk, Kenya, drinks from a fountain that draws its water from solar-powered panels that condense water vapor from the air, Aug. 11, 2018. The "hydropanels," produced by U.S.-based technology company Zero Mass Water, pull water vapor from the air and condense it into a reservoir. Cody Friesen, Zero Mass Water's founder and chief executive officer, said the company's project with the Samburu Girls Foundation was an example of its efforts to make sure the technology "is accessible to people across the socioeconomic spectrum." 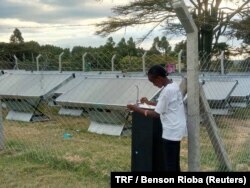 George Sirro, a solar engineer with Solatrend Ltd., a Nairobi-based solar equipment company, said such devices can be a huge help not only to people but in slowing deforestation that is driving climate change and worsening drought in Kenya. Philip Lerno a senior chief in Loosuk, where the girls' foundation is located, said he hopes to see the panels more widely used in the surrounding community, which usually experiences long dry periods each year.